We've setup all the Microsoft plugins on our Dev server and everything is working apart from the sync'ing of users from Azure AD. 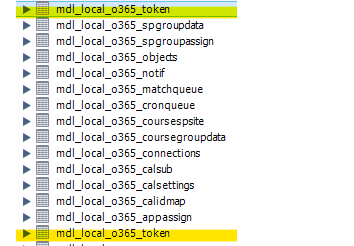 On running the Scheduled task 'Sync users with Azure AD' I get the following outputted to screen and nothing is then updated for the user in the database, does the user need to authenticate before the mdl_user table updates? All downloaded from Moodle plugins site - is this where my issues lie, should I be using the latest git release? To note it only seems to run 200 full sync'd users at a time, not 1000, like it says. Hi @mmulrthelp - The version on Moodle.org is the latest stable version, so you're good there. Make sure you have the latest version from Moodle.org though - what version is your local_o365? I'm not sure why you have two tables though... They're both named the same though, maybe this is an issue with the database viewing application? Strange. Looking at the output you posted, it looks like this user is a "matched" user - i.e. they have not yet logged in to the site, correct? A "matched" user just sets up a user for a future connection, but the user has to actually log in to the Moodle site using their Office 365 credentials to complete the connection. User information syncing will only happen after this connection has been completed. Hi @jamesmcq - The above now makes sense. The part about the sync match could do with being in the manual, I'm sure it's confused others as well. I've been testing it all on our dev server before hopefully going live with it this summer, therefore I've not had students logging in. Just some colleagues, but didn't get them to try before I had done the above SQL. I solved the part with the two identical database tables by uninstalling the office 365 plugins, checking the database tables where removed and reinstalling.